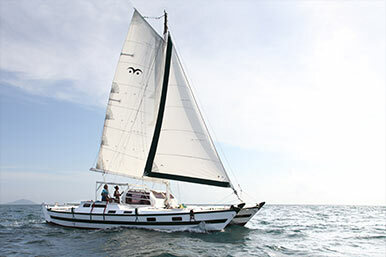 The typical charter catamaran offered on the market seems primarily designed around western style living comforts rather than sea worthiness and sailing abilities. Such charter catamarans tend to be large, have plenty of ensuite sleeping cabins, perhaps air conditioning and big engines too. Unavoidably, they are heavy for their size. 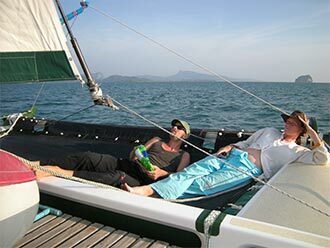 They certainly do offer all the comforts of a villa but unfortunately often have the sailing abilities (and the charter price) of a villa too! 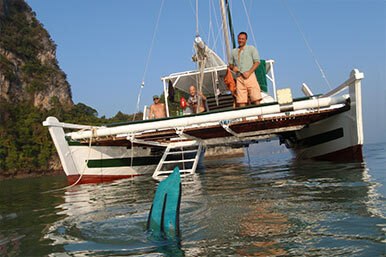 Do you really want to charter an expensive sailing boat that does not sail well? 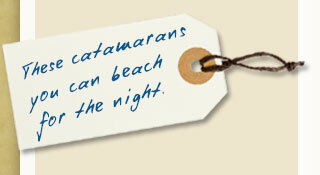 Our Tiki 38's have a different approach of what is an ideal charter cat. 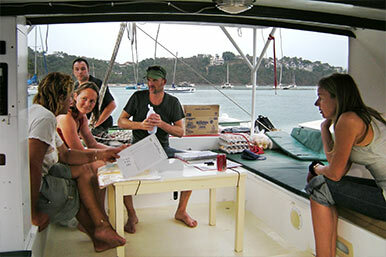 First of all boats definitely need to sail well, so Tiki's are light, sleek and graceful. As life in the tropics is mostly lived and enjoyed outdoors there is a big shaded cockpit rather than an enormous saloon. For the same reason the entire deck surface between bows and sterns is level and usable. 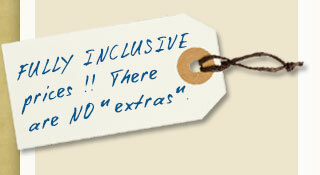 Cabins are most certainly very comfortable but need not be excessively big as they are rarely used during the day time. 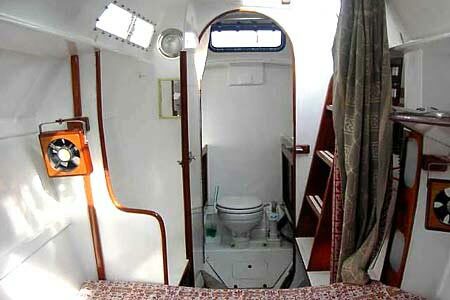 We simply see no need for four bathrooms on a five cabin boat. So, is this a case of "less is more"? 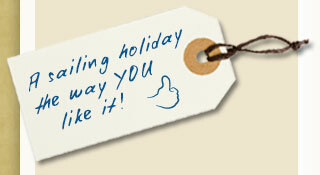 We certainly do think so. A Tiki 38 is much lighter, will sail better, and yet have more practical outdoor living space than any regular charter cat of comparable length. And you can beach her too. 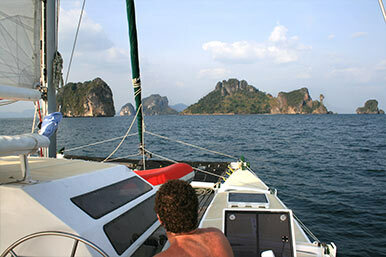 A Tiki 38 catamaran is, as we see it, the ideal Thailand sailing charter yacht for groups up to 6-7 people. 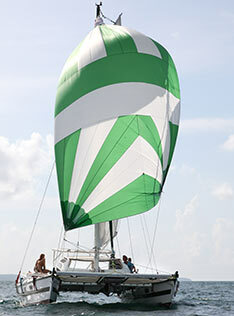 Easy to handle, fast & fun sailing in open water and highly manoeverable in close quarters. Shallow draught and the ability to take the ground open up the possibility of exploring places well away from the crowds. A huge deck and excellent sleeping cabins. 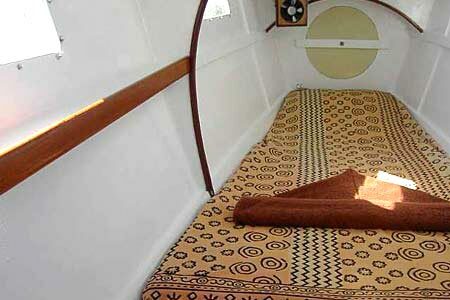 All the necessary creature comforts for truly tropical sailing, notably a large bimini and a big fridge! 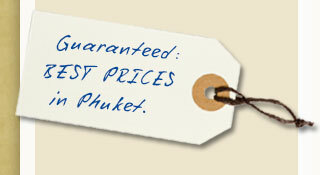 The only thing that is "less" about a Tiki 38 is the charter price. A lot less. 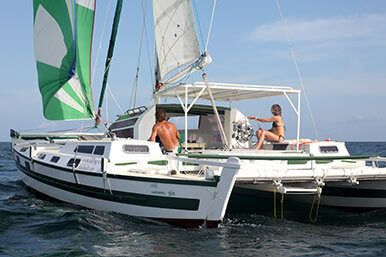 a Tiki 38 catamaran is just perfect for outdoor living. 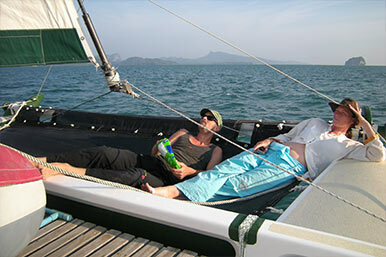 The slatted decks offer plenty of space for all on board and the bow nets are coveted places for lazing and relaxing. 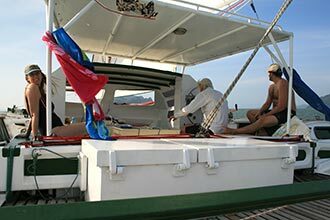 The unique boarding ladder gives easy access for swimming, a second boarding ladder between the bows allows you to get off the boat without getting wet when the boat is semi beached. 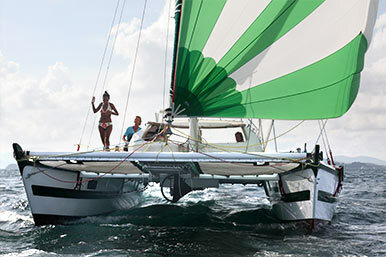 You have a choice of two rigs: one T38 has a "standard modern catamaran rig" with a heavily roached fully battened bermuda main and a fractional jib. 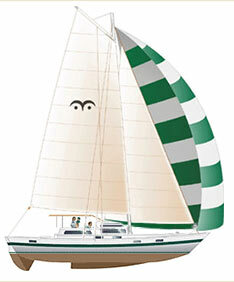 The other has a "softwing sloop" rig which has a short gaff and the luff of the main sail sleeved around the mast. 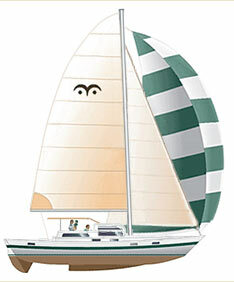 Jibs are roller reefed, a gennaker with snuffer for easy setting and dousing is great for light down wind work and is part of the standard sail inventory. Engine power is provided by a marine diesel which drives twin propellers via a hydraulic system. Maneuverability is outstanding. There is a powerful electric anchor winch ( 2 anchors and plenty of rode), 500ltr fresh water capacity in two tanks, a 100 ltrs fridge, the necessary electronics and a well equipped galley too. 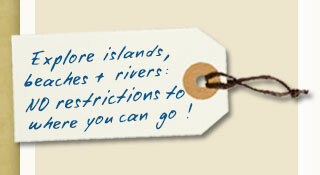 You'll find the boat's inventory impressive. 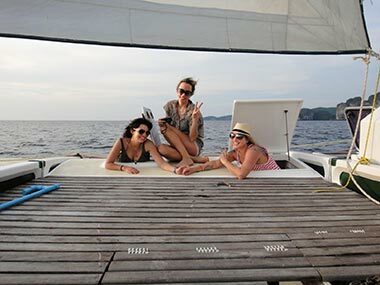 Your Tiki 38 catamaran has in each hull a comfortable double cabin as well as a spacious private single cabin. 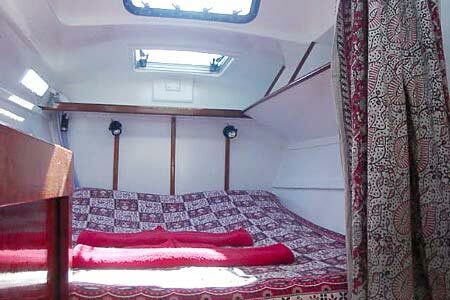 In addition the deck cabin has a large double bed. Though she will sleep 8 adults if needed, 6-7 is a comfortable maximum. Cabins are light and airy with opening hatches and portholes. In addition there is an electric fan over each bed. Each bed has it's own reading light too. There is one enclosed shower/toilet compartment with vanity basin and mirror, additionally, there is a second fresh water shower on deck. 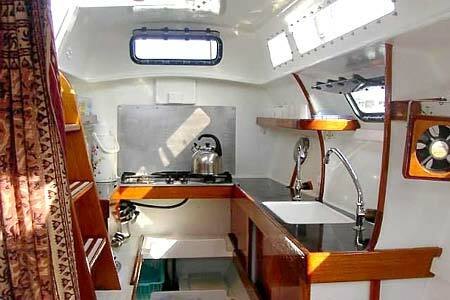 The galley is very well equipped, spacious and cleverly laid out with ample worktop space and storage. There is a two burner cooker with flame failure cut-outs. 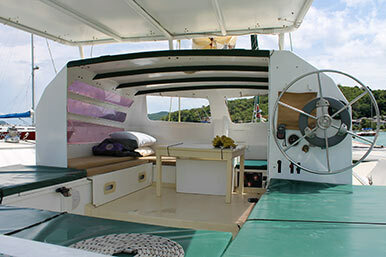 Cockpit is large, deep (safe for children) and well shaded by a fixed bimini. 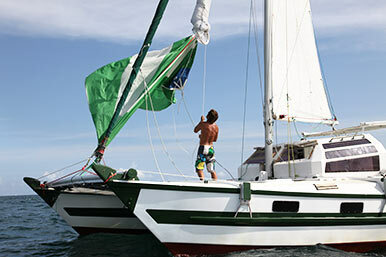 The bimini can in minutes be extended to a full-size awning for use when at anchor.